In the two hours that we spend talking, Raymond Pettibon’s eyes make contact with mine no more than twice. His hands tremor. The pauses between not just sentences, but individual words, stretch so long that I take to counting the seconds in my head. But these long silences come from an artist who’s made some of the worthiest noise of the last four decades. 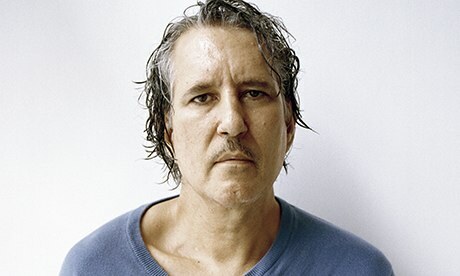 Firstly, via the literal discord of the beyond-legendary punk band Black Flag, founded by Pettibon’s brother Greg Ginn (Pettibon is a pseudonym) in Hermosa Beach, California in the late 70s; and secondly, as a hyper-verbal visual artist. His words, in other words, are worth the wait. Sonic Youth Pettibon’s much-parodied artwork for Sonic Youth’s album Goo. The gallery has just co-published a huge book of his political drawings, Here’s Your Irony Back. Almost all of them are caustic and brilliant. One made me laugh out loud. It’s of a marine, mooning, but as usual it’s the accompanying text that delivers the dart of humour: “This is for the liberal news media back home!” In fact they rather liked it. He claims that most of these drawings, “are reportage, which you weren’t ever going to see from the journalistic institutions that were supposed to be doing that… the editorial pages of the Washington Post and New York Times… they’re nothing but cartoonish. Really. I’m stuck doing their reportage.” People are meant to become more conservative, or at least more politically resigned as they age. I don’t think that applies in Pettibon’s case. “I really haven’t changed,” he agrees. He insists he was never actually in Black Flag. “I did learn their songs on bass, but I got out in the nick of time and I’m glad because making art is so time-consuming. The way I do it, anyway. I mean, it would have been a disaster with Greg.” The band went through 16 different lineup changes before breaking up in 1986. Now there are two re-formed groups. One, Black Flag, consists of Greg Ginn plus Gregory Moore, Ron Reyes and Dave Klein. The other, called simply Flag, comprises Keith Morris, Chuck Dukowski, Dez Cadena, Bill Stevenson and Stephen Egerton. “Greg sued them of course,” says Pettibon. “He was always suing someone. I think he lost that case.” Ginn did indeed lose his preliminary injunction in October. He briefly reveals what he’s listening to these days (Lil B and Gucci Mane) before, somehow, the interview devolves into a game of baseball. The ball machine is positioned at one end of the studio, the end that has portraits of Babe Ruth and Lou Gehrig hanging on the wall, and the batter takes their stance at the other end, beside bins rammed with vintage bats. As the balls are sent ricocheting off the ceiling, thudding into canvases, his two assistants whoop and yell. Pettibon says nothing at all.